Dr. Ahmed has over 20 years of experience in eye disease management and primary clinical eye care. Having been awarded the Faculty of Science Gold Medal from the University of Alberta, Dr. Ahmed went on to the University of Waterloo to obtain a degree in Optometry. He did an Ocular Disease externship in Phoenix, AZ, where he developed a passion for the medical side of the profession. Graduating top of the faculty, Dr. Ahmed decided to move back to Alberta and put his skills to work in a disease management setting with a local ophthalmologist. He opened Mission Eye Care in 2005 with the vision to be on the leading edge of primary eye care. He believes strongly in collaborative care and continues to work closely with ophthalmology specialists throughout Calgary in the best interests of our patients. He manages many chronic eye disease patients including those with glaucoma and diabetes. He also has a wealth of knowledge and special interest in the treatment and management of Dry Eyes and Corneal Diseases. He continues to receive referrals for his skills in the fitting of specialty contact lenses for those with keratoconus, corneal transplant, and ectasia from failed laser refractive surgery. Dr. Ahmed continues to lecture both locally and nationally on eye disease and continues to educate first and second year family medicine residents from the University of Calgary. He is also very proud of his volunteer work with Canadian Vision Care, a charity which supplies eye care to developing nations worldwide. He is also former president of the Alberta Association of Optometrists, having served on the board for over a decade. 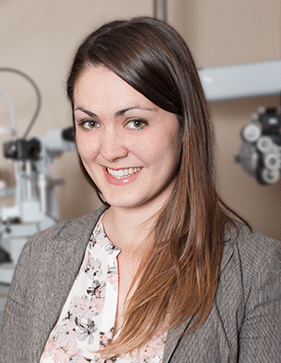 Dr. Lasby is a Calgary native and completed her Optometry degree at the University of Waterloo. She then went on to do a residency at the prestigious Northeastern State University Oklahoma College of Optometry. Only a select few are admitted to this residency that provides intensive training on ocular disease and post-surgical care with an emphasis on corneal disease and specialty contact lens fitting. She was recipient of the Canadian Association of Optometrists Award of Merit for leadership, the Dr. Irving Baker Excellence in Clinical Optometry scholarship, and numerous others during her studies. She served as the Calgary Society of Optometrists’ President from 2015-2017, and is chair of the Canadian Association of Optometry’s Cornea, Contact Lens, and Refractive Technology Section. She also currently serves on the council of the Alberta Association of Optometrists. Dr.Lasby continues to enjoy teaching, and currently is the lead optometric lecturer for first and second year family medicine residents at the University of Calgary academic section on primary eye care. She is preceptor for final year Optometry interns from the University of Waterloo and also continues to lecture across North America on contact lenses. She is an expert with fitting contact lenses for keratoconus and other corneal diseases including post-surgical transplant patients. She also has a special interest in dry eye management and myopia control using orthokeratology contact lenses. Her kind demeanor and clinical skills inspire confidence with her loyal patients! Dr. Morrison is a native of Alberta who moved back after serving on faculty at the University of Houston College of Optometry as chief of the Contact Lens and Cornea clinic at the University Eye Institute. We are proud to have such an accomplished and well respected Optometrist here at Mission Eye Care. She studied at Pacific University College of Optometry, where she earned her Doctor of Optometry, Master of Vision Science, and Residency in Cornea & Contact Lenses. Her academic and clinical accomplishments are well renowned in the eye care world and she enjoys lecturing throughout North America about topics related to vision and quality of life for patients. As clinical instructor and provider for the UHCO Myopia Control Clinic, her teaching and research included specialty contact lens and anterior segment-related topics. 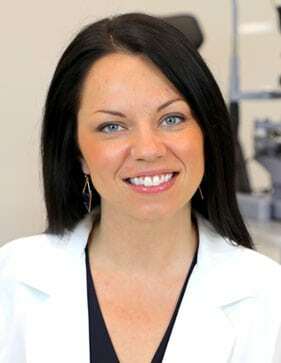 She has expertise in contact lens management for patients who have corneal/ocular surface irregularity due to disease, trauma, or high refractive error, with particular interest in contact lenses for pediatrics and for patients with keratoconus. Dr. Morrison is a fellow and committee member of the Scleral Lens Education Society, editorial reviewer for the Journal of Contact Lens Research & Science, and a board member of the Cornea and Contact Lens Section of the Canadian Association of Optometrists. With all this, her primary focus is providing and preserving vision through excellent comprehensive patient care for all ages. She is currently welcoming new patients. 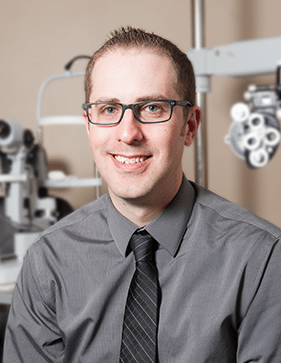 Dr. O’Brien is an alumnus of the Illinois College of Optometry in Chicago where he graduated with honours. After spending 4 years in Chicago, he returned to the Calgary area to put his skills to work in a private practice setting where he could provide the most comprehensive care to his patients. In addition to his experience in Chicago, Dr. O’Brien trained with a variety of sub-specialists at the Veterans Affairs Medical Hospital in Alabama, the Mid Florida Eye Center near Orlando, and the Atlantic Eye Institute in Jacksonville, Florida. With a strong foundation in both primary eye care and disease management, he continues to provide the highest quality eye health care to our patients. Having been at Mission Eye Care since 2009, his loyal following of patients is constantly impressed by his professionalism, thoroughness, and approachable style of communication. He believes strongly in preventative eye care and ensures his patients are taken care of with the high level of service that Mission Eye Care is known for. Dr. O’Brien is currently practicing 2 days per week and is welcoming new patients.